What a good visit home for the holidays! Just as good was the moment when Hannah was spotted at Dilkon-Bashas’ wearing this beautiful color coordinated outfit centered around her purse. This brief encounter revealed that it was her birthday: “Happy Birthday!” Hannah dressed the part of a birthday girl and added a birthday outfit essential- sparkle! The cute bow belt added just enough shine to this interesting mix of femininity and masculinity. The biker jacket and chain purse straps provide an edge to the sheer fabric of the skirt, top, and leggings. Coincidentally, the second photo captures two unique style interpretations. Both of a skirt worn by two Navajo ladies from different generations. 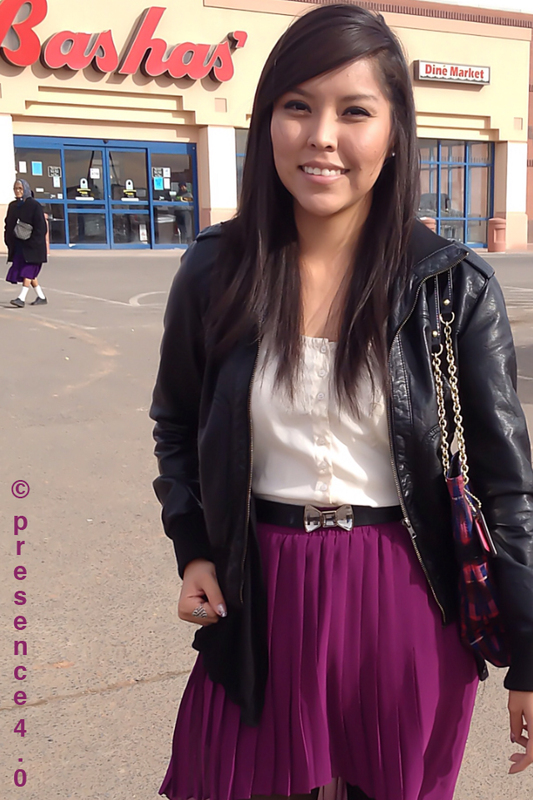 In the background is an elderly Navajo woman wearing a “traditional Navajo” skirt. A skirt adapted by Navajo after much interaction with Spanish settlers and fabric sold by Anglo traders after the mid-1800s in the Southwest. The “traditional” skirt definitely compliments the modern piece that Hannah has on. Both Navajo ladies are wearing the same color skirts and jackets but different cuts and fabric. It is a nizhoni (“beautiful”) sight that speaks to an acceptance of new styles and continuance of older ones. Hannah says she aims for comfort in whatever she wears and keeps up with the latest trends via several style/fashion blogs. The work has paid off as she is now featured on our pioneering blog! *Please see the ABOUT section regarding copyright guidelines when reusing and redistributing photos.